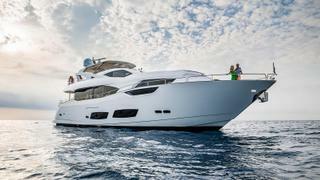 A brand-new 28.95 metre Sunseeker motor yacht has been sold by Cassidy Woods at Sunseeker Malta. Currently under construction in GRP by British yard Sunseeker International, she is due for delivery in Malta in June 2018 as a Sunseeker 95 model. A high-gloss interior in wenge wood will accommodate up to ten guests in five cabins comprising a main deck master suite, two mirror-image VIP suites and two identical twins, all with entertainment centres and en-suite bathroom facilities. The split-level main saloon will have comfortable settees and an armchair, coffee tables and a wet bar with an ice maker and three bar stools, and there is an entertainment centre including a large screen LED television and a stereo surround sound system. Forward is a formal dining area with seating for 10 guests. The aft deck comes into its own for al fresco entertaining and dining, offering built-in upholstered seating and a teak table with folding leaves. Up on the flybridge there is a helm station with four helm chairs, a folding radar arch, U-shaped built-in seating, a wet bar, fridge, ice maker, barbecue grill and two tables, all protected from the sun by a large Bimini top. She will be the first Sunseeker 95 model to sport the new MAN V12 1900 diesel engines allowing a cruising speed of 24 knots and a maximum speed of 29 knots. The price of the new Sunseeker 95 has been withheld.